Last Friday, Tech unveiled their new basketball uniforms during the “Live at the Thrillerdome” event as a part of the program’s new uniform deal with Adidas. 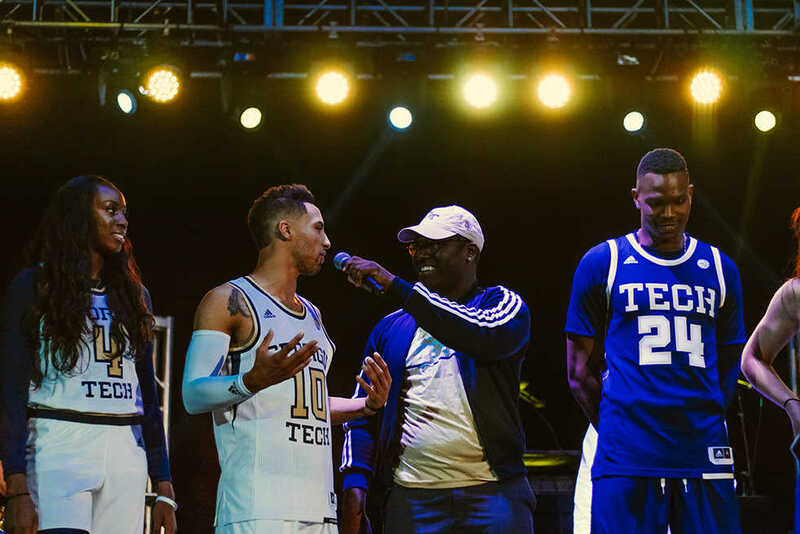 Rap duo Rae Sremmurd performed as Tech’s men’s and women’s basketball teams showed off the new designs for their uniforms and kicked off their first seasons under the Adidas brand. The event commenced late Friday night as Tech players participated in a series of exhibition competitions, pairing up and participating in a three-point contest. Men’s coach Josh Pastner and women’s coach Machelle Joseph also competed, each pairing off with an audience member and participating in a shooting drill competition. Following the skill showcases, Tech unveiled their new uniforms, having players from both the men’s and women’s team model the new designs. Tech unveiled white, gold and navy uniform variants for both teams, featuring the new design elements revealed earlier this year as a part of Tech’s comprehensive athletic-image redesign under Adidas, including Tech’s newly-standardized shade of gold and typeface. The event is a departure from Tech season-opening events of years past; this is the first time in recent memory that the basketball teams have partnered with the homecoming artist, and the result was an enthusiastic crowd. Following the unveiling, Rae Sremmurd took the stage and performed some of their hits like “Black Beatles” and “Come Get Her”. Rae Sremmurd invited Tech’s teams onstage for some of their songs as well, dancing along with the teams. Tech men’s basketball opens the season officially against Lamar on November 11, while the women’s team’s first game is on the road against Houston on November 9.